↑ 1.0 1.1 1.2 1.3 1.4 1.5 1.6 Stromberg, Joseph (15 August 2013). "For the First Time in 35 Years, A New Carnivorous Mammal Species is Discovered in the American Continents". Smithsonian Magazine. http://www.smithsonianmag.com/science-nature/For-the-First-Time-in-35-Years-A-New-Carnivorous-Mammal-Species-is-Discovered-in-the-Western-Hemisphere--219762981.html। আহৰণ কৰা হৈছে: 15 August 2013. ↑ 4.0 4.1 Borenstein, Seth (15 August 2013). "Adorable New Mammal Species Found 'In Plain Sight'". ABC News. http://abcnews.go.com/Technology/wireStory/adorable-mammal-species-found-plain-sight-19967921। আহৰণ কৰা হৈছে: 15 August 2013. ↑ Kim, Meeri (16 August 2013). "Smithsonian unearths a new species of mammal: The olinguito". Washington Post. http://www.washingtonpost.com/national/health-science/smithsonian-unearths-a-new-species-of-carnivore---the-olinguito/2013/08/15/2fb13b6c-051a-11e3-a07f-49ddc7417125_story.html। আহৰণ কৰা হৈছে: 16 August 2013. ↑ "New animal discovered in Andes". WRAL. http://www.wral.com/news/local/video/12780040। আহৰণ কৰা হৈছে: 16 August 2013. ↑ "A new mammal. Peekaboo". The Economist. 17 August 2013. http://www.economist.com/news/science-and-technology/21583594-peekaboo। আহৰণ কৰা হৈছে: 15 August 2013. ↑ 8.0 8.1 8.2 8.3 8.4 O'Brien, Jane (15 August 2013). 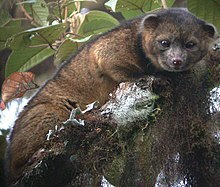 "Olinguito: 'Overlooked' mammal carnivore is major discovery". BBC News. http://www.bbc.co.uk/news/science-environment-23701151। আহৰণ কৰা হৈছে: 15 August 2013. ↑ K.-P. Koepfli, M. E. Gompper, E. Eizirik, C.-C. Ho, L. Linden, J. E. Maldonado, R. K. Wayne (2007-06). "Phylogeny of the Procyonidae (Mammalia: Carvnivora): Molecules, morphology and the Great American Interchange". Molecular Phylogenetics and Evolution খণ্ড 43 (3): 1076–1095. doi:10.1016/j.ympev.2006.10.003. PMID 17174109. ↑ 10.0 10.1 Landau, Elizabeth (15 August 2013). "New cute furry mammal species discovered". CNN. http://www.cnn.com/2013/08/15/world/americas/new-mammal-smithsonian/। আহৰণ কৰা হৈছে: 15 August 2013. ↑ 11.0 11.1 11.2 11.3 Helgen, K. M.; Pinto, M.; Kays, R.; Helgen, L.; Tsuchiya, M.; Quinn, A.; Wilson, D.; Maldonado, J. (15 August 2013). "Taxonomic revision of the olingos (Bassaricyon), with description of a new species, the Olinguito". ZooKeys খণ্ড 324: 1–83. doi:10.3897/zookeys.324.5827.